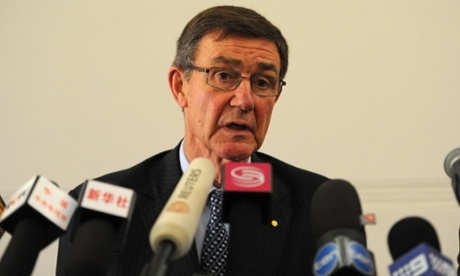 PERTH, AUSTRALIA – APRIL 01: Retired Australian air chief marshall Angus Houston speaks about the missing Malaysia Airlines flight MH370 at a press conference on April 1, 2014 in Perth, Australia. Houston, who is heading a new search coordination centre in Perth, said it was the most challenging search and rescue operation he had ever seen and cautioned about any quick fixes. The airliner disappeared on March 8 with 239 passengers and crew on board and is suspected to have crashed into the southern Indian Ocean.